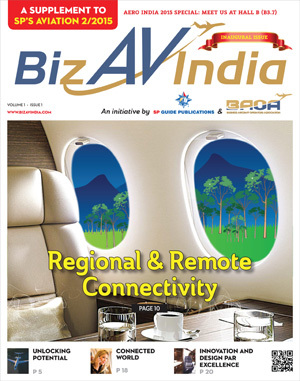 On the eve of Aero India 2015, SP Guide Publications and Business Aviation Operators Association (BAOA) launched ‘BizAvIndia’, a quarterly magazine which will focus on the challenges and opportunities of business aviation, a segment which has tremendous potential to grow. 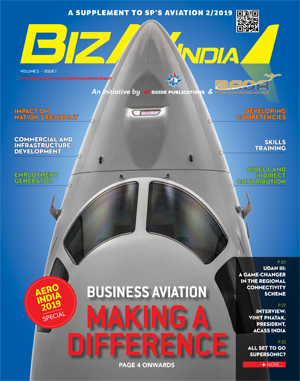 ‘BizAvIndia’ is a supplement of SP’s Aviation, the flagship aviation magazine from SP Guide Publications. 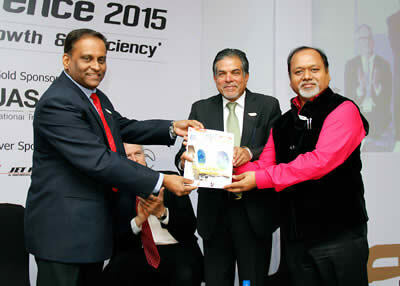 ‘BizAvIndia’ was launched by the Joint Secretary of Civil Aviation, Mr. G.Asok Kumar at the BizAvIndia conference. The first copy was handed over to the Editor-in-Chief and Chairman and Managing Director of SP Guide Publications, Mr. Jayant Baranwal in the presence of Mr. Peter Bunce, President and CEO of General Aviation Manufacturers Association (GAMA) and Mr. Kurt Edwards, Director General of the International Business Aviation Council (IBAC). 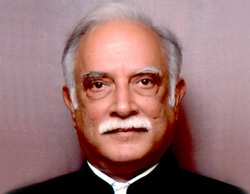 In a first of its kind in the aviation sector, in India, an industry body and a publishing house have joined hands to further promote the interest of the industry which is in a fledgling state, so to say. The magazine will be for and by the business aviation industry in coordination with BAOA. Speaking on the launch of ‘BizAvIndia’, Mr. Rohit Kapur appreciated the efforts of SP Guide Publications, particularly that of Mr. Jayant Baranwal who ‘is passionate and supportive of business aviation’. BAOA, he added, is happy to be partnering with SP Guide Publications which has earned a name for itself in aerospace and defence publishing. The inaugural issue is focussed on regional and remote connectivity in the light of the present government’s push to expand pan-India air connectivity. The issue has several articles written by industry experts which are informative, analytical and forward-looking. There is a perspective from original equipment manufacturer (OEM) Embraer, thus reflecting how important OEMs are in the overall development of the aviation sector in India.